Attempt to fill an empty space (Performance Anxiety)’, 2008, 6 channel video installation. Dimensions variable. Edition of 5 + AP. 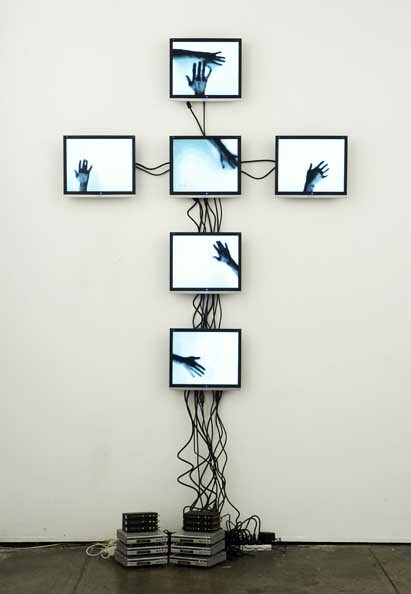 In his Andrew Newman’s work ‘Attempt to fill an empty space (Performance Anxiety)’, 2008, Newman’s hand quivers as he reaches for the hand of the other. Wavering before the embrace. It is in this moment, in this attempt, in this action, that Newman loves. Before the embrace. His hand shakes. Bridging that space between him and the absent other. In his work ‘Grounded’, 2009, Newman revisits ground where he has made love, collecting samples of dirt, hoping to find remnants of her body and remants of his. Newman seems to discover the elusive ‘oneness’ in these clumps of soil where him and the other merge together in the ground. Newman’s practise has been concerned with this disconnection from the other and the entailing desire for the absent being. Newman enters the screen space by recording his body on video. Amputating elements of himself form the real world and mailing them off to the horizonless realm of the screen. Newman exists without horizon, and by further distorting his eixstence within the temporal plane of the screen, Newman’s self becomes the imaginary, an abstract that could transmute into anything, including the absent other. Newman uses his performative projects to unravel what he considers the conflict between two desires for the other, drawn from two Greek gods, the sons of Aphrodite. Pothos, a desire for the absent being, and Himeros, the more burning desire for the present being. Through his work Newman reveals the absurd alienation of the individual, forever disconnected by these desires.